Applications are invited from suitably qualified candidates for admission to Tertiary Institutions in Nigeria for the 2017/2018 academic session. The period of sale/registration for UTME is from Monday 20th March to Wednesday 19th April 2017 while registration closes on Saturday 22nd April 2017. For DIRECT ENTRY, the application will be on sale from Sunday 23 April, 2017.
i. Each candidate must have a personal e-mail address and mobile phone number. iii. Each candidate must personally create a JAMB profile on the JAMB Portal through JAMB Mobile App available on Android, Windows and iOS platforms OR visit a Bank, NIPOST to create his/her JAMB profile on the JAMB portal: www.jamb.org.ng. Name, date of birth, personal e-mail address and place of origin are required to create the profile. iv. Payment for JAMB’s E-PIN-registration and the recommended reading text is done at the banks and NIPOST. Banks have also agreed to make these services available at CBT centres and JAMB State Offices. v. Each Candidate should visit any accredited CBT Centre with his/her personal details, the profile and evidence of payment. a) e-brochure showing guidelines on admission detailing list of tertiary institutions and available programmes of study. b) Syllabus (e-syllabus) for the examination. c) Step by step guide on completion of the application form. vii. Each Candidate is to complete the online application form by supplying the required details such as name, e-mail address, L.G.A., academic qualification, etc. ix. O/L and/or A/L grades are to be provided by candidates. Candidates who are awaiting result should supply the result online as soon as the results are available on JAMB’s portal. 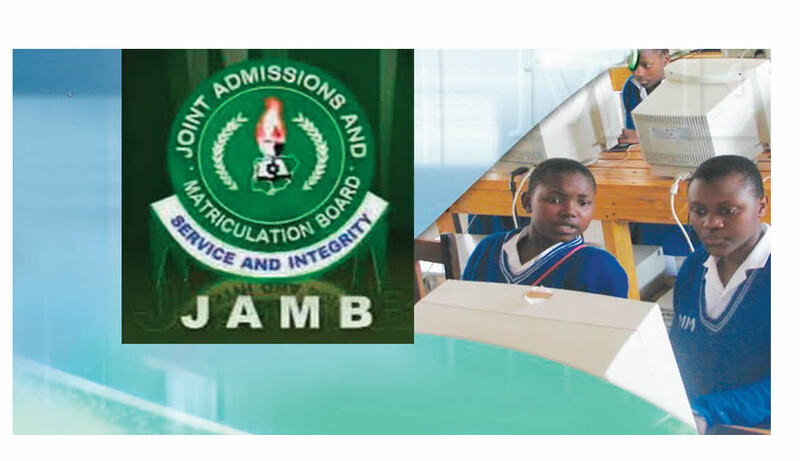 No recommendations from any Institution will be considered by JAMB if the candidate has not supplied his/her O/L result on the portal of JAMB. There will be no offline registration, as all the accredited CBT centres have been empowered for real life online registration. No candidate should register at any centre other than the accredited CBT Centre and JAMB State office. Any candidate who is registered outside approved centres will be identified and disqualified. (c) Passes in two major subjects in the NCE with S.S.C.E., NTC/NBC credits or equivalents in THREE other subjects (mainly for Education Courses) and ND. Education may be accepted as a third A’ Level subject for those taking courses in Education. On the 2017 registration platform, Candidates are to note that their 1 choice can be a College of Education, University, Innovation Enterprise Institutes, Polytechnics/Monotechnics, NDA (Nigerian Defence Academy) or Nigeria Police Academy. The 2017 UTME will commence on 6 May and end on 20 May, 2017 (excluding May 12, 2017 because of Candidates sitting for WAEC’s Further Mathematics examination). The venue of the examination will be at any centre in the candidate’s chosen examination town. Matriculation Examination or Direct Entry is Five Thousand Naira (₦5,000) only. Candidates are also, as usual, to pay Five Hundred Naira (₦500) only to obtain the reading text- “In Dependence” for UTME candidates and “The Last Days at Forcados High School” for Direct Entry Candidates. Candidates should note that e-PINS being purchased are tied to individual profile and are not transferable. Candidates are advised to keep as confidential their security details such as registration numbers, password/numbers of ATM Cards, e-mail addresses and E-Pins. The Board will mount a mock examination in all the accredited CBT centres to prepare and familiarise INTERESTED Candidates with the CBT environment. Interested candidates are advised to indicate their interest in the mock examination during the registration process. The CBT Centres are allowed to collect through their (CBT Centres) bank accounts, a separate Seven Hundred Naira (₦700) only, for this exercise after notification of centre has been received by the Candidate. The payment for mock examination shall be made to the centres to which the candidate is assigned after the notification of assigned centres for the mock examination. NOTE: Do Not pay for Mock until JAMB assigns you to a CBT centre. The mock examination shall take place on Saturday 8 April, 2017. In line with the Board’s regulated registration exercise, only the accredited Computer Based Test Centres and JAMB States and FCT Offices will be allowed to register candidates. This is to avoid exploitation, off-line registration, mismatch of candidates’ particulars and other registration-irregularities. The registration fee, once paid is non-refundable. Examination (UTME) is available at the CBT centres and JAMB Offices Nationwide. The accredited centres have been empowered to assist in this regard. As it is the practice, centres are allowed to charge not more than Seven Hundred Naira (₦700) only as registration fee. Any centre that charges more than Seven Hundred Naira (₦700) should be reported to JAMB for appropriate sanctions. All CBT centres have been mandated to select any of the participating banks. These banks are to be present in their premises for the purposes of collection all fees. No centre-staff is allowed to conduct cash transaction with the candidates. Multiple registrations are not allowed. Candidates who register more than once will be identified and disqualified. Candidates are to note that irrespective of their choice of course of study or method of testing, they will also be tested on a general text: “In Dependence” by Sarah Ladipo Manyika for UTME and “The Last Days at Forcados High School” by A.H. Mohammed for Direct Entry Candidates. Candidates are warned that the Board has not authorized or solicited the services of ANY establishment/group or individual other than the accredited CBT centres for this registration exercise.